Moving memories: oral history in a global world is the title and theme of the next Oral History Australia Conference in Sydney, 13-16 September 2017. The Conference Flyer has all the details for submissions and important dates. Michele and I became colleagues when Deakin University merged with Victoria College in 1991. She was based on the Toorak Campus (since closed) and I commuted there regularly to teach, and we’d occasionally catch up. I was aware of her research interest in post-war German-Jewish migration to Australia and this overlapped with my own research into Jewish migration to Australia, German-Jewish history and the Holocaust, but, as is often the case in university life, we somehow never got around to discussing our mutual interests until Michele, frustrated by unsuccessful attempts to gain research funding for future projects, suggested that we work together in applying for a research grant. The result of her initiative demonstrated how fruitful collaboration can be in the Humanities, despite its traditional bias towards solitary research. Michele’s passion for oral history was the catalyst for our success. With Peter Monteath of Flinders University and, thanks to the support of Jewish Holocaust Centre in Melbourne, we were awarded an ARC Linkage Grant in 2003 to investigate the Centre’s groundbreaking collection of survivor video testimonies. The grant not only funded research assistance but it also included a scholarship for a PhD student. This gave Michele, who was a committed and conscientious post-graduate supervisor, great satisfaction. Researching the Centre’s video testimony collection required us both to make compromises and broaden our interests. I had previously had little experience dealing with oral evidence and remained somewhat sceptical of its value. Now I came to appreciate the richness and methodological complexity of such accounts and the insights into lived histories they could provide. Michele, whose primary interest lay in migration experiences, found the traumatic nature of Holocaust testimony hard to deal with, not to mention the idiosyncrasies of Jewish traditions and the labyrinthine and brutal quality of Nazi genocidal practices shaping the testimonies. The end result nonetheless was highly productive. At a rough estimate we produced seven co-publications including the edited collection with Dvir Abramovich, Testifying to the Holocaust (2008) and numerous individual publications based on research into the video testimony collection and related themes. It remains an abiding mystery to me how we managed to write joint pieces which in the end flowed so seamlessly that I now have trouble identifying what part each of us wrote. While our collaboration comprised only a part of Michele’s multiple research interests which extended as far afield as the Northern Territory, South East Asia and Canada and to topics as diverse as Welsh Patagonians and intangible heritage, I am grateful to have benefitted from her commitment to listening to and viewing ordinary people recounting extraordinary events. 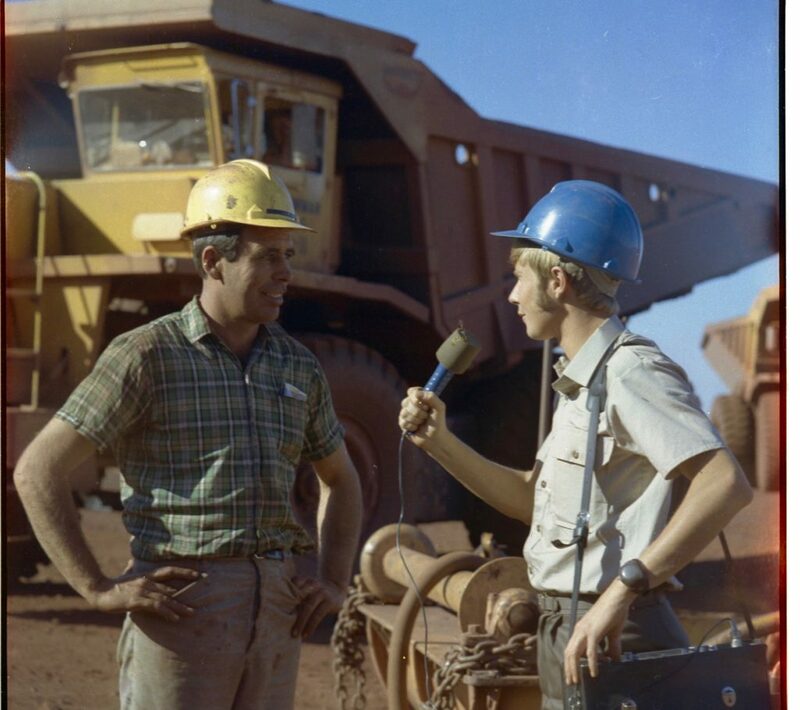 In the late 1960s and early 1970s, as a journalist for the ABC, John Francis began recording people in Outback South and Western Australia and the Northern Territory. Many were elderly, living mostly in remote communities or in isolation, working as prospectors, on stations or in virtual ‘ghost towns’. John Francis in 1989 recording a radio documentary at Mount Tom Price, Western Australia. After ‘another lifetime’ in newspapers and magazines John is once again recording, this time using video. In his video blog (vlog) below, John discusses a journalist’s approach to recording oral history, reflects on his experiences and includes samples of interviews. John Francis specialises in producing personal and family life histories at Let’s Remember This: www.letsrememberthis.com. One of Oral History Victoria’s premier events, the Symposium – Culture, Community and Oral History : Stories of Diversity, Conflict and Resilience, was held recently and considered a great success by all who attended. I love so many things about oral history. I love the fact that people from so many different contexts and backgrounds do it – community historians, workers in museums and cultural organisations, professional and freelance historians, advocacy workers and care workers, students of many different kinds, and even the occasional academic like me – and that although we do oral history in different ways and for different reasons, we’re all animated by an enthusiasm for recording and working with people’s life stories. I love the fact that oral history can make a difference. That ‘small stories’ can change how we understand the world, past and present; that telling your own story can be affirming and empowering; that hearing stories like one’s own – or not like one’s own – can be transformative. I love the fact that the world of oral history seems to be populated by so many fine, fun, generous people, which may be because good oral historians are good at listening, and are interested in other people and their stories and interests (a Mexican friend once told me that she thinks it may also be because the vast majority of oral historians are women!). I love the fact that oral historians are good collaborators. By definition we cannot work alone, and we often collaborate not just with people and their stories, but also with a range of institutions and voluntary organisations. All of these qualities and passions were on show, in abundance, at this year’s OHV symposium about Culture, Community and Oral History: Stories of Diversity, Conflict and Resilience’, at MUSEO Italiano in Carlton (many thanks to the museum!!). In the opening sessions on Immigration and Australian Communities, Moya McFadzean from Museum Victoria talked us through the approaches and issues involved in making museum exhibitions about migration, culture and diversity – in a wonderful keynote opening to the day. Melissa Afentoulis explored the values and challenges of a community oral history project with Greek migrants from Lemnos, which is also the basis of her PhD; and weaver, artist and community activist Anneli Rickards explained her life’s work of recording and documenting Finnish migrants to Australia. The second session focused on Organisations and Oral History. Gretel Evans (with Jodie Boyd) spoke on behalf of several colleagues about their Young Christian Workers’ oral history project and what they learnt about power of an activist faith, with colleagues and interviewees joining in an illuminating discussion. Marie Nunan introduced her oral history project with people who have worked and volunteered with Barwon Health, and highlighted both the value of the project and the ways in which some stories are difficult, if not impossible, for people to share. The final panel session was about “telling Community History through the Individual’. Melissa Walsh explained how the Big Issue Classroom enables people who have been homeless to narrate their life stories to groups of mostly school students, and how this social enterprise benefits the ‘guest speakers’ (who get paid) and informs young audiences about homelessness. Big Issue Classroom guest speaker Julian Ogle talked frankly and thoughtfully about his own experience of developing and performing his story. Narrative researcher and graduate student student Elena Balcaiti used her narrative work about passionate sports fans, and her work with her ‘contributor’ Lee, to introduce issues about the ‘magical’ work of co-creating personal narratives and using them to make sense of bigger issues. The panel – and the symposium participants – then enjoyed a vigorous discussion of several issues from the session that also connected to earlier presentations: What are the challenges in eliciting and recording people’s life stories? What are the challenges in presenting and interpreting people’s life stories? How is life experience articulated though personal narrative, and how might that story-telling impact upon the narrator? What is the value of these types of oral history work? I came away inspired by the diversity and value of oral history practice, and by the activist engagement and generosity of spirit of oral historians – in all our varieties. is open to all community-based oral history practitioners, including freelance workers and professional historians, and members of voluntary organisations and public institutions (excluding educational institutions). is open to students and staff working in an educational institution. Applicant/s contact address, phone number, email and (where available) web address. In no more than 500 words, a description of the project and explanation of why it is deserving of an award for innovation in the creation, interpretation and / or presentation of oral history. A list of all outputs produced by the project, including web addresses where appropriate. Alistair Thomson (Chair of judging panel): email alistair.thomson@monash.edu; postal address: History Program, Monash University, Clayton 3800. Susan Faine: email susan@susanfaine.com.au; address: OHV c/-Royal Historical Society of Victoria, 239 A’Beckett Street, Melbourne, 3000. Linda Patrick: email linda@farmingminds.com.au; postal address: PO Box 34, Shoreham, 3916. As OHV members have already been notified, former Deakin University historian and Oral History Victoria member Michele Langfield died recently after a spell of ill-health. Among many achievements, Michele played a significant role in recording video testimonies of Holocaust survivors at Melbourne’s Holocaust Centre. She published important work based on these interviews, including the article ‘Capturing the Intangible: Holocaust Survivor Testimonies Held in the Jewish Holocaust Museum and Research Centre, Melbourne’, published in the Oral History Association of Australia Journal (28, 2006, 7-13), and the very fine book Testifying to the Holocaust (with Pam Maclean and Dvir Abramovich), published by the Australian Association of Jewish studies in 2008. A memorial service was held for Michele on 26 July at Montsalvat in Eltham. Oral History Victoria is excited to announce that it is planning its first group exhibition in partnership with The Good Room Social History, Documenting & Sound Gallery in Brunswick East. This will be a 4-week exhibition in from 23 November until 21 December 2016. This is a fantastic opportunity to promote the work of Oral History Victoria and to showcase the work of its members. This is an open entry exhibition. An invitation is extended to all Oral History Victoria members to submit your showcase piece. Submit your favourite interview (audio/visual or just audio is fine). Join Sarah Rood, professional historian from Way Back When Consulting Historians, for this introduction to oral history practice, focusing on research, ethics, equipment, interviewing techniques and transcribing. Suitable for students, volunteers, or anyone with an interest in recording oral histories, you will gain valuable insights into the work of doing oral history. Learn how to prepare questions; about the forms, the ethics and permissions involved; and the top tips to a good interview. Sarah uses real examples to illustrate some of the pitfalls and some of the gems from actual interviews. You will have the opportunity to practise writing questions, as well as to conduct a short interview. Please bring your recording device with you. How do we make sense of the memories that we record as oral historians? How do we begin to transform stories into histories? In this workshop with Monash University History Professor Alistair Thomson we’ll consider a range of ways of approaching the interpretation of memories. As indicated in the letter from the OHV President emailed to members in May and reprinted in the June edition of REWIND, several members of the existing OHV Committee will be stepping down at the end of their current term of office in October. Any OHV members interested in joining the committee are warmly encouraged to contact the President (email: Alistair.thomson@monash.edu or phone: 0452 221 589) ahead of the next AGM. While some expressions of interest have now been received in this regard, the request for new nominations remains open. In seeking new nominations, Al’s email noted that the committee workload is shared so that it is not onerous, and that it’s a fun group to work with and from which to learn more about oral history. This year’s ASRA Conference will be held at the National Film and Sound Archive, McCoy Circuit, Acton in Canberra from Wednesday 31 August to Friday 2 September. The conference theme this year is ‘Getting It Done – Crunch Time for Audio Archives‘ which explores the projects and programs being developed and undertaken by audio archivists in response to the urgent imperative to preserve and digitise collections in a climate of restricted resources and limited time frames. The program will include papers by experts and practitioners with experience from across the audiovisual collections sector, including researchers, archivists, preservation specialists, collectors, oral historians, academics, broadcast professionals and creative practitioners.